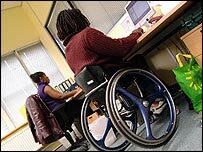 Thousands of sick and disabled people could be deprived of incapacity benefits because of plans to toughen up the eligibility test, campaigners warn. Changes to the Personal Capability Assessment were announced last year as part of welfare reform. But the National Association of Welfare Rights Advisers (NAWRA) said the "whole essence" of the test had been changed. Minister John Hutton said: "There is absolutely no question ... of trying to make things harder for individuals." Under welfare reform plans, Incapacity Benefit and Jobseekers Allowance would be scrapped and replaced with a single Employment and Support Allowance for those whose health affects their ability to work. NAWRA criticised the Department for Work and Pensions for using "legal experts" to draft the tests rather than experts in occupational and mental health, physical and learning disabilities. But Jim Murphy, minister for Employment and Welfare Reform, said the draft regulations "fully reflected" the views of medical experts who were involved in the review. Among NAWRA's criticisms, it said the draft regulations had increased the number of tests orginally set by other experts and altered their severity. It said original tests would be harder for people with physical problems but easier for those with mental health problems. Trials of the original test found that a quarter of current claimants with physical problems would fail to qualify for sickness benefits. However, a sixth of those who would have been excluded by the old mental health test would pass under the new assessment. When the test appeared in the draft regulations, it had been changed, NAWRA said. "The whole essence of the test has changed,' said Judy Stenger, mental health welfare rights adviser. "In fact there have been 70-odd changes made by DWP legal experts...all of which seem to make it harder for claimants to secure sickness status because of their mental health. "Vulnerable claimants who would have been deemed unfit for work in the eyes of experts will now find themselves forced to negotiate the considerable challenges of survival as job seekers. "And it won't just hurt people's pockets, it will also harm their mental health." The new test would also make it far harder for people with limited intellectual functioning to answer questions about their state of health accurately, NAWRA said. "'Previously, people with severe mental health problems or significant learning disabilities were exempted from the Personal Capability Assessment," said association chairman Alan Markey. "This will no longer be the case within Employment and Support Allowance." Mr Murphy said the assessment review was aimed at making sure "individuals are better assessed so that we can provide them with exactly the support and help they need, whether that be through additional benefits or tailored help to find work." The current assessment did not accurately assess people who had relatively minor levels of physical limitation, nor people with mental health problems and learning disabilities, he said. "As we now know more about the work and help that individuals can undertake and the help they need to enable them to work, it is right that the PCA is reviewed to take these into account," Mr Murphy added.